We visited Chicago for a quick 3 day visit. 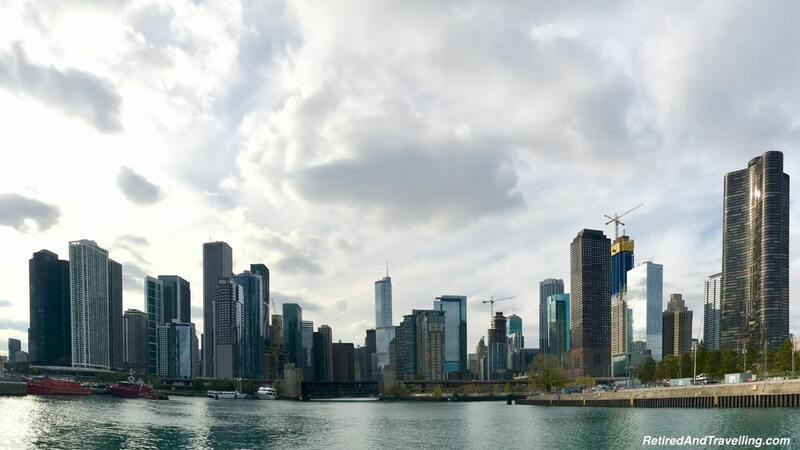 When I studied at university for Civil Engineering, a visit to Chicago was always the engineering field trip. 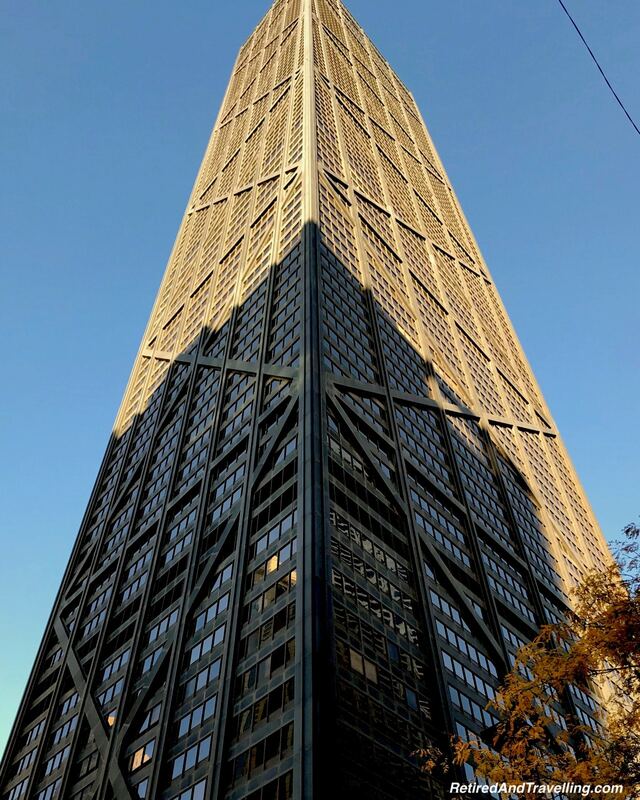 So I had some idea that Chicago would be an architectural treasure. But I never imagined how much eclectic Chicago architecture we would find everywhere we looked. Our hotel for the visit was the Intercontinental Chicago Magnificent Mile. It was located right in the midst of some of the most unique buildings. 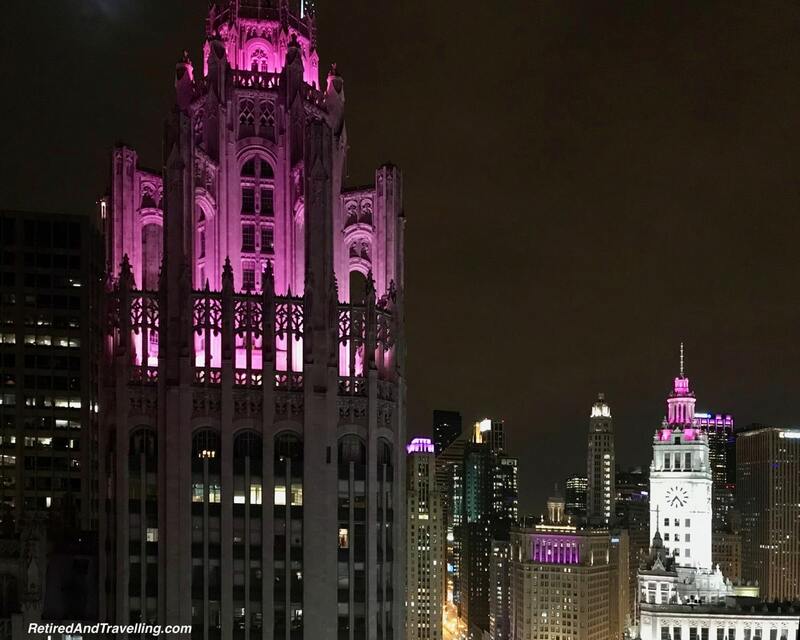 Our view from the room showed included the Chicago Tribune and the Wrigley building. But the hotel itself was an architectural discovery. The building used to be the Medinah Athletic Club. Inside and outside we found the most eclectic design. 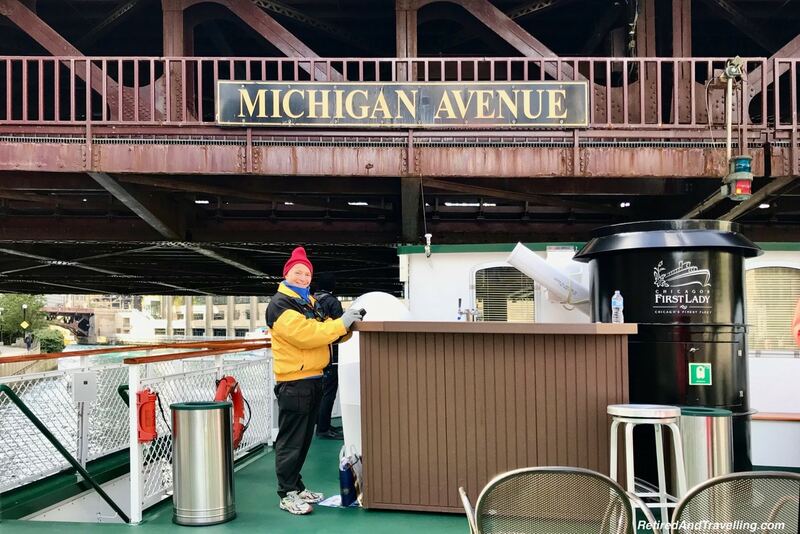 Of course, we did not leave Chicago without taking the Architecture River Cruise. The cruise provided a view of so many other interesting buildings. And a great history lesson on Chicago! As soon as we pulled up to the Intercontinental Chicago Magnificent Mile we knew we were in for a treat. The building edifice was carved. High up on top we saw the gold dome that was once a decorative dirigible dock. 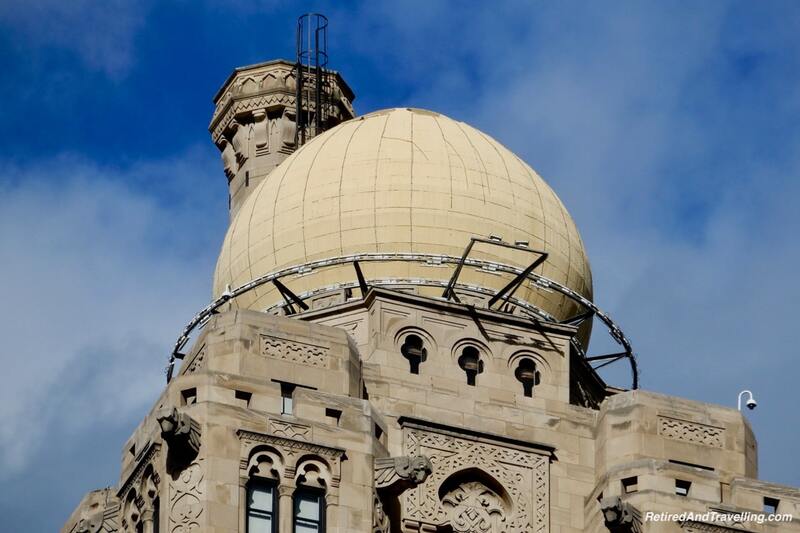 The Medinah history of this building was evident all through the older tower of this hotel. From our hotel room we could see the Du Sable bridge that crossed the river. 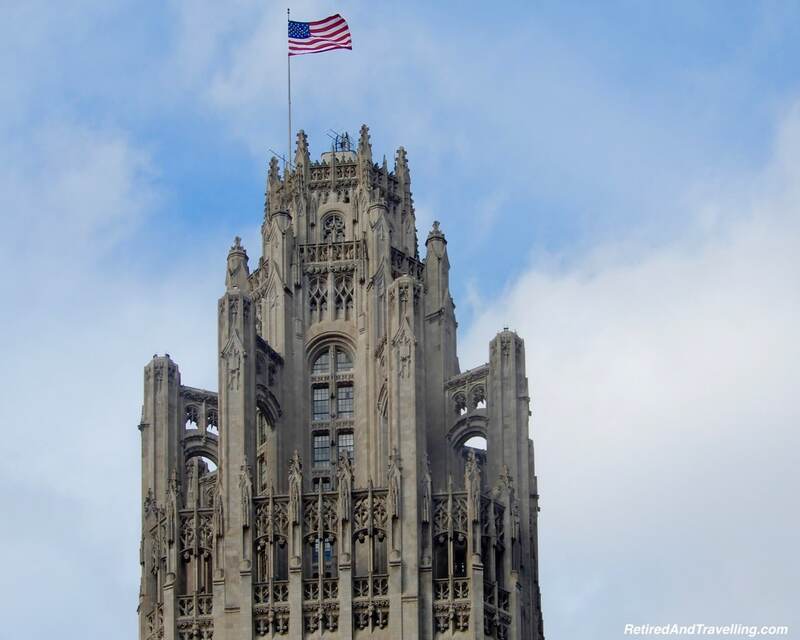 On one side of the bridge we saw the Wrigley building and on the other the decorative top of the Chicago Tribune. At ground level we walked around these architectural treats. At night the buildings were lit and colourful. The NBC building was a distinctive shape. This modern building displayed modern buttresses, more decorative than structural in nature. 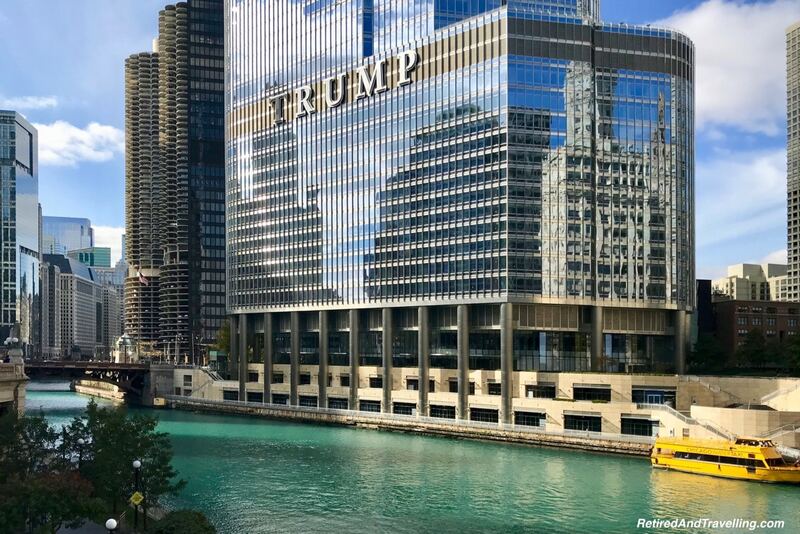 A short walk to the Chicago River and we got a view of the Trump Tower. 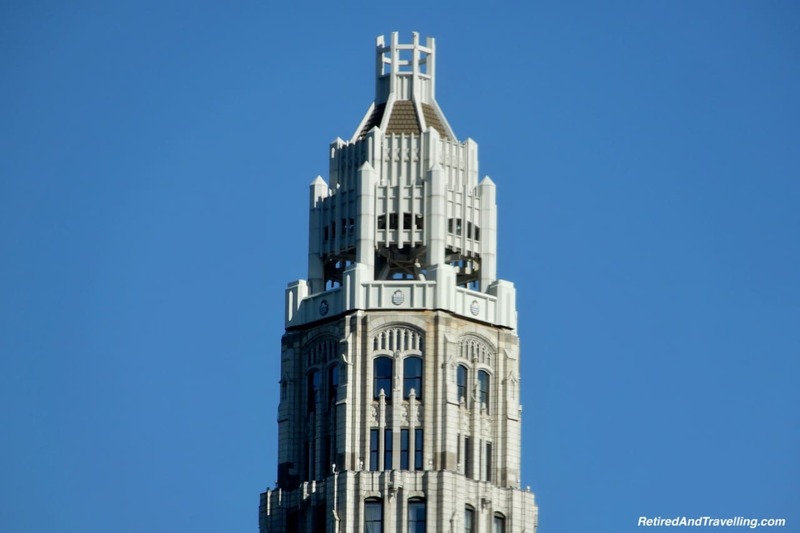 When it was designed, it was to be the tallest building in the world. But after the September 11 attacks, the building was scaled lower. 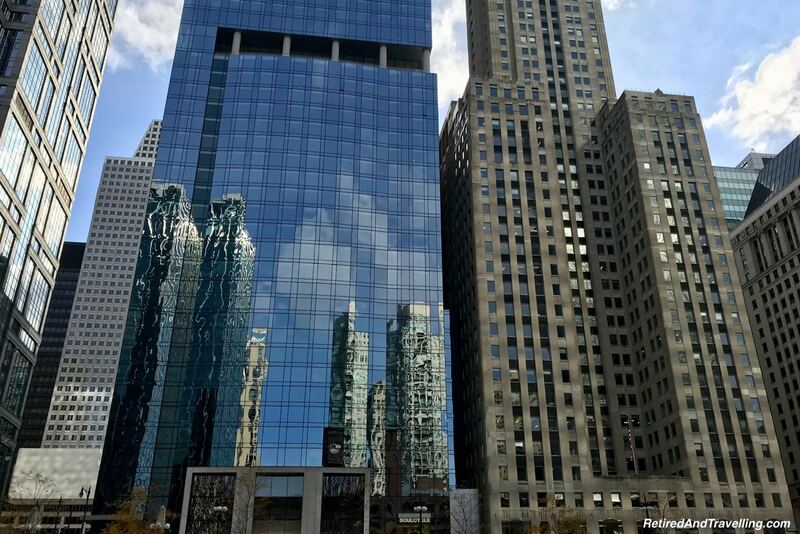 This modern glass building catches the reflections of buildings around it. We walked down the Magnificent Mile to the John Hancock Tower for a sunset view. The John Hancock building stands high above many others. 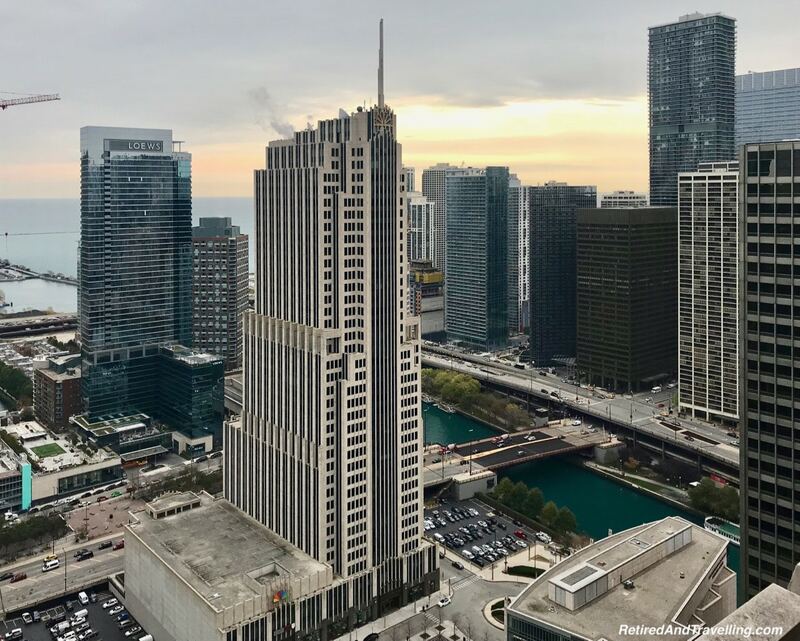 The Signature Lounge and restaurant on the 96th floor are a great place to catch 360º views of the eclectic Chicago architecture. 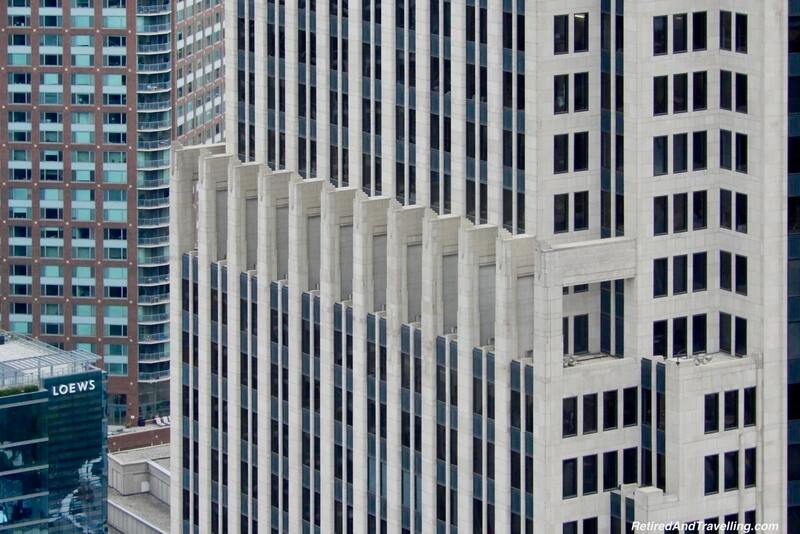 This is the second highest building in Chicago, after the Sears Tower (aka Willis Tower). On the way to the John Hancock Tower, we passed a small building that looked like a castle. It was really the Chicago Water Tower. 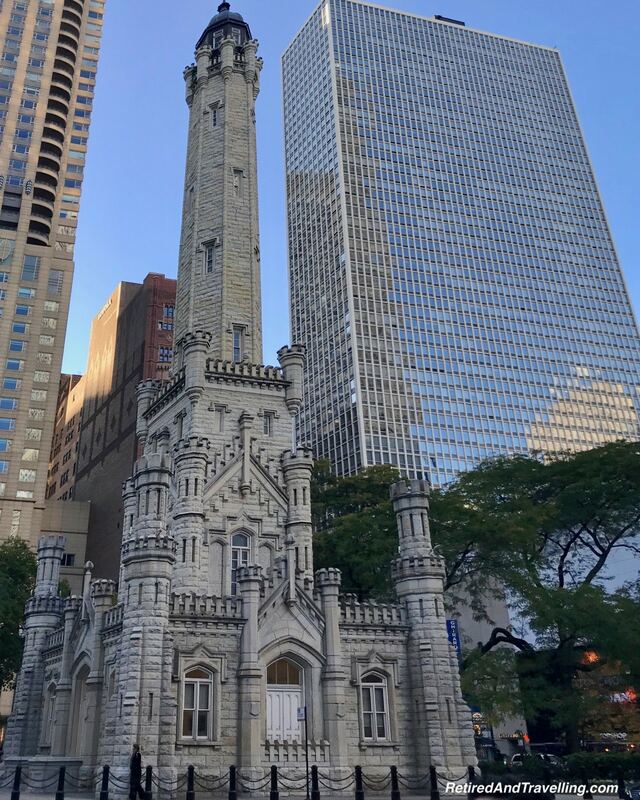 This is the second oldest water tower in the U.S.
A short walk from our hotel, we had the most amazing view of the eclectic Chicago Architecture. 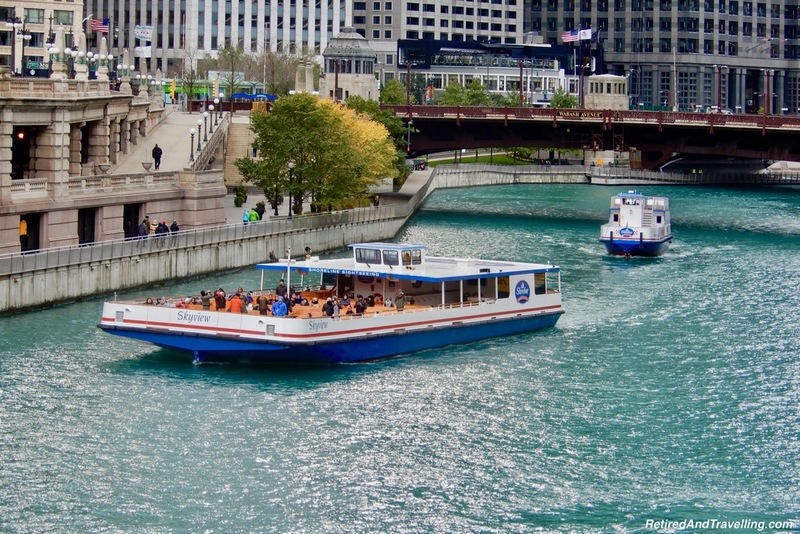 When we asked people for suggestions for things to do in Chicago, the Architecture River Cruise was always near the top of the list. There are several different companies that offer this tour. 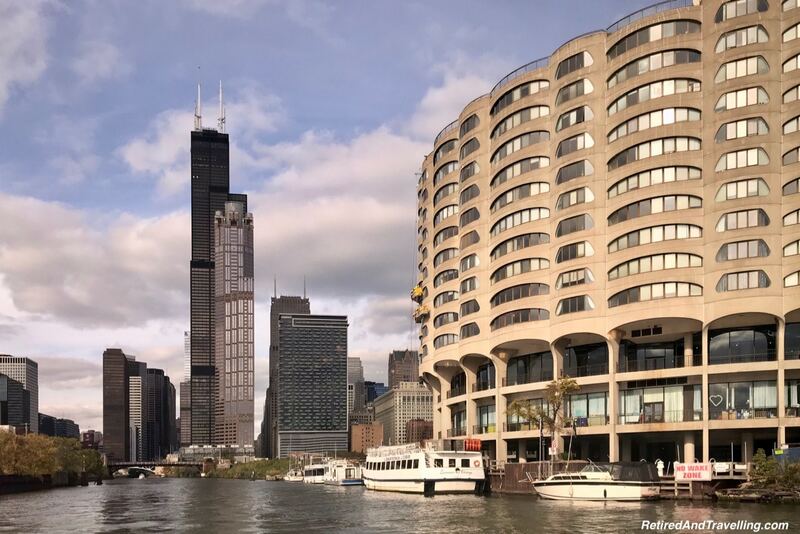 We talked with the concierge at the hotel and he recommended the Chicago Architecture Foundation Cruise on the Chicago First Lady boats. The dock was located on the river close to our hotel. 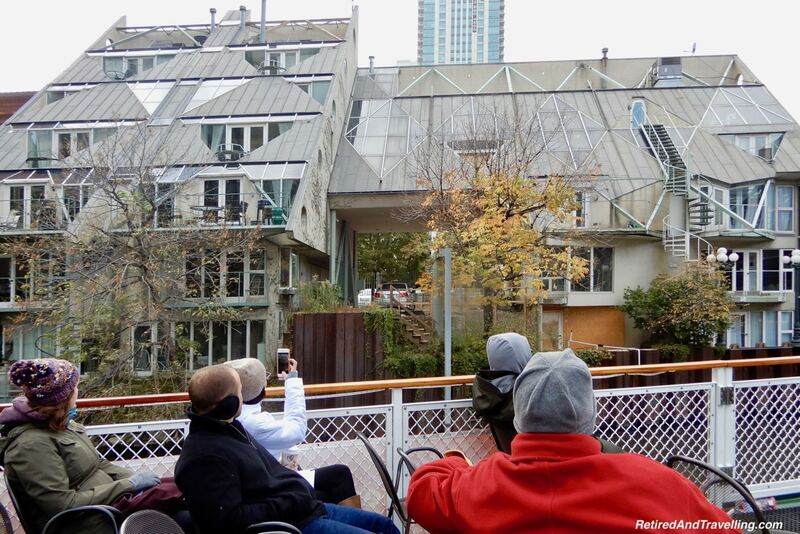 It was a chilly day for our architecture cruise. The top of the boat was wide open but there was a large inside lounge. We stayed on top of the boat for most of the trip. An occasional trip inside warmed us up enough to head back outdoors. 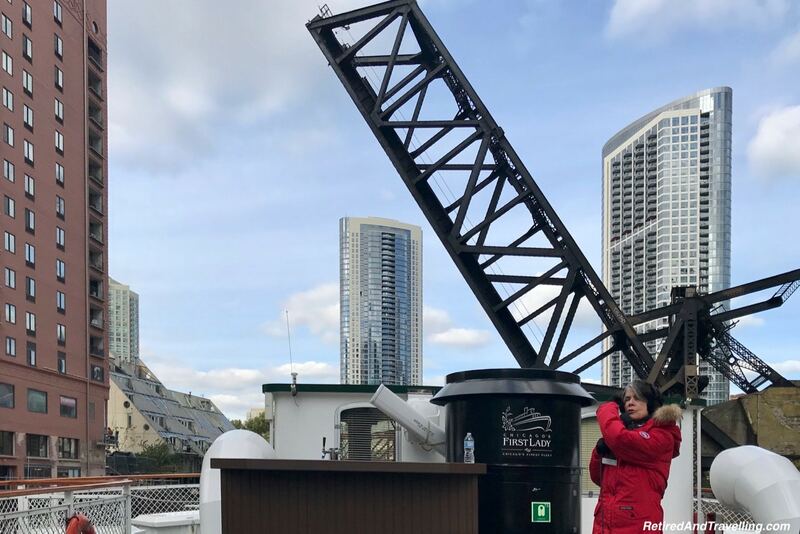 Volunteer Docents man the boats and offer non-stop informative tales as the boat moves along several different branches of the rivers through Chicago. 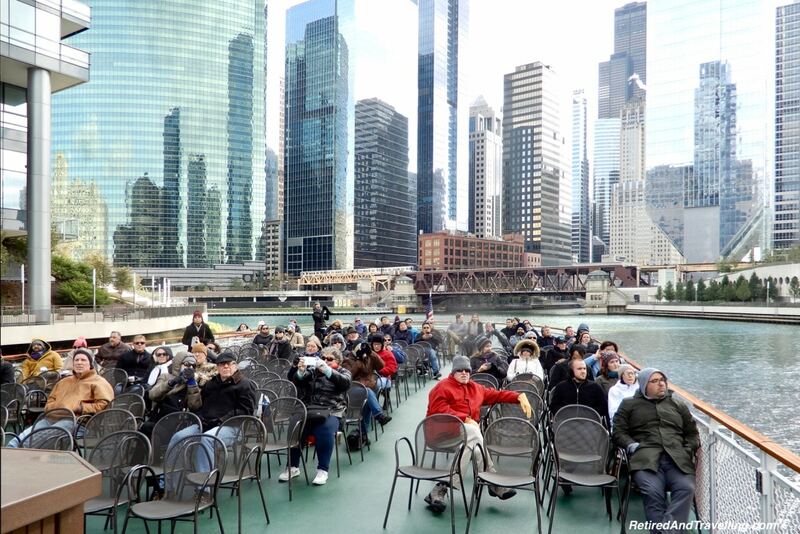 The architecture cruise provided a great insight into the history of Chicago. We saw old large commercial buildings. Many of these have been re-purposed and restored. 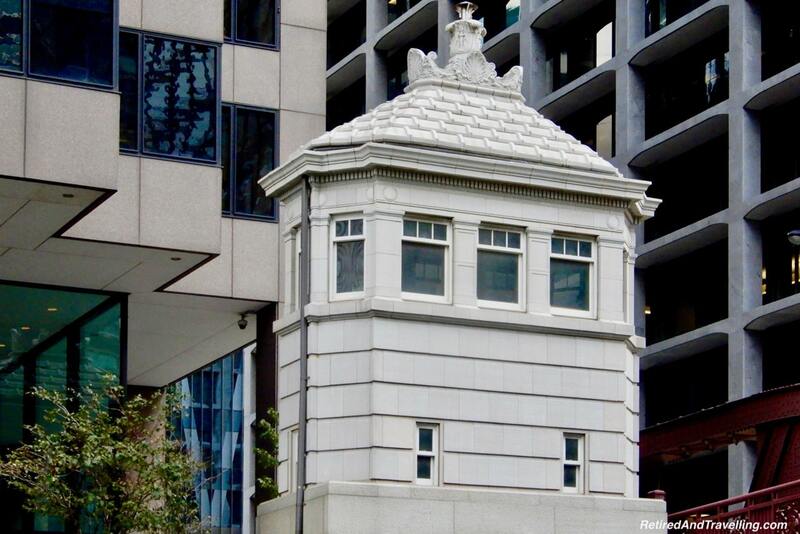 Historic decorative buildings sat side-by-side with contemporary glass buildings. 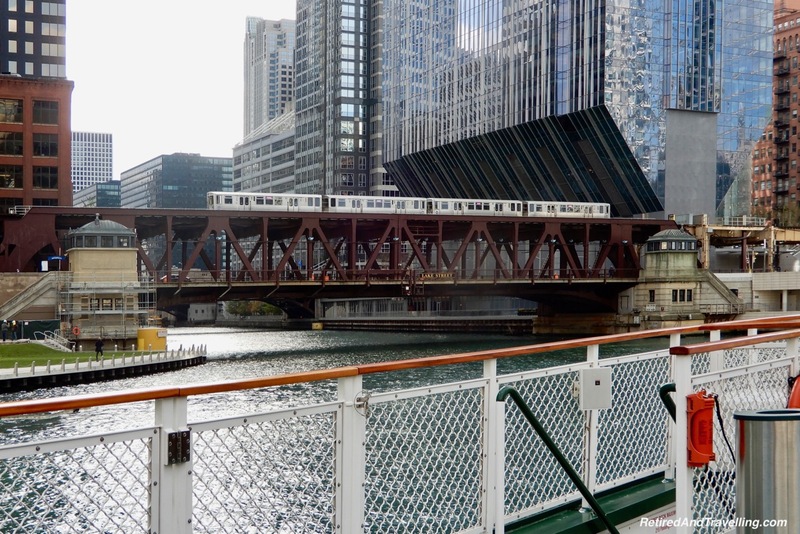 The river cruise showed the eclectic Chicago architecture. 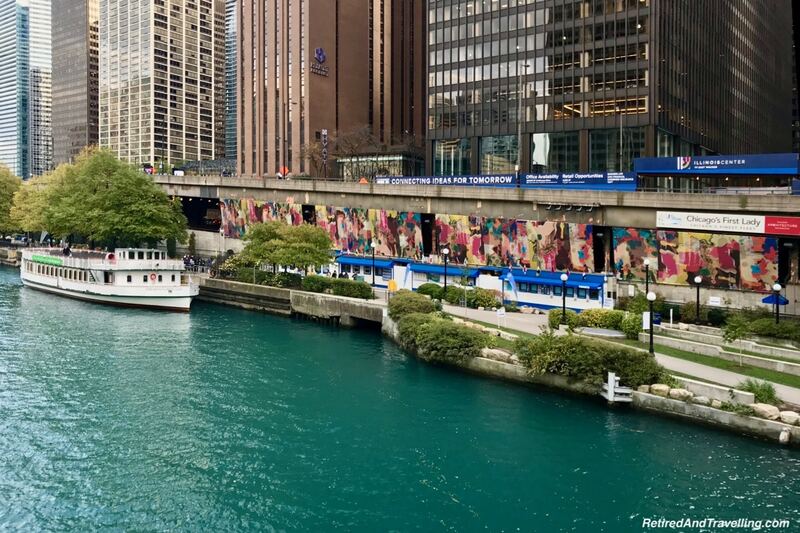 There are 38 movable bridges across the various branches of the Chicago River in downtown Chicago. These trunion bascule bridges are moved with a counterweight and may be single or double-leafed. Our architectural cruise took us under many of these. Most of the bridges have only one level but some have an upper deck as well. On some of the bridges we saw the L Train (short for “elevated”) cross. 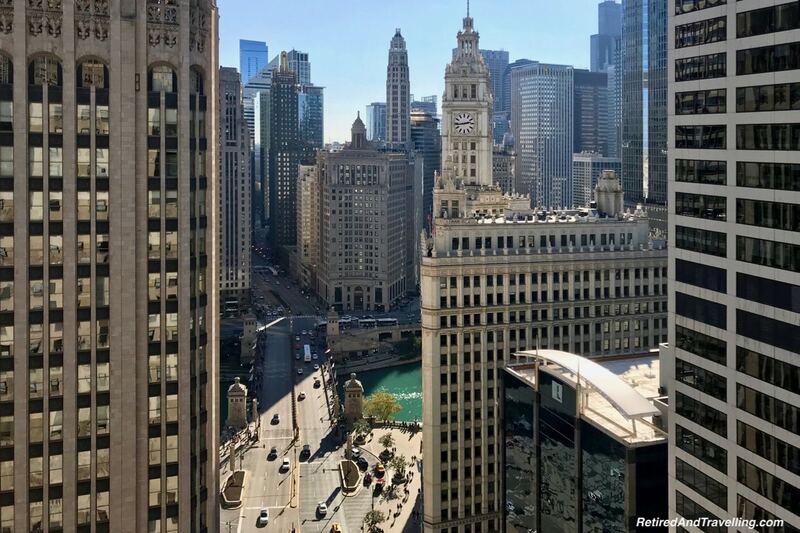 Downtown bridges open approximately 100 times a year from April to November. We did not see any of the bridges open while we were in Chicago. Bridge openings take eight to ten minutes—from the time the gates lower to the moment traffic is clear to cross. But we did see the abandoned truss bridge that remains permanently open. This provided a great view of the counterweights used to move the bridge. As we cruised along the river, we saw a variety of bridge tender houses beside the bridges. 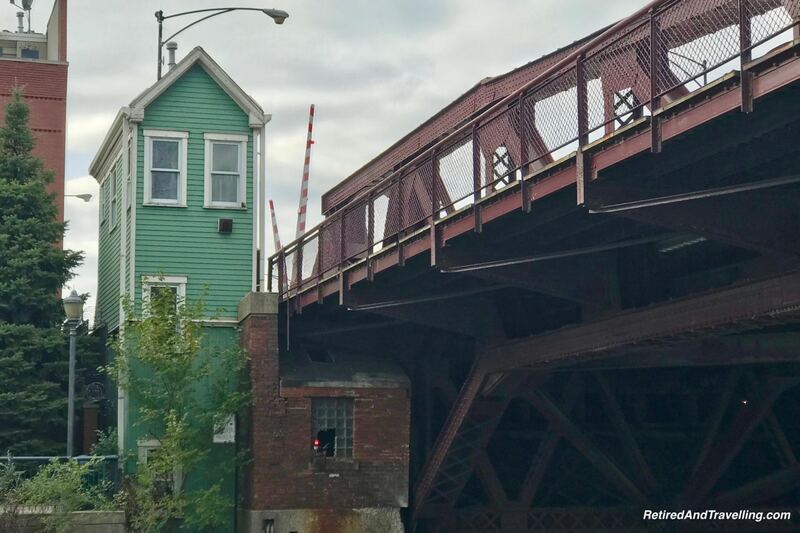 Chicago originally hired “tenders” to monitor river traffic and keep the peace on the bridge. At that time, bridge tenders lived in the tender houses. The amount of time depends on how many vessels need to pass. 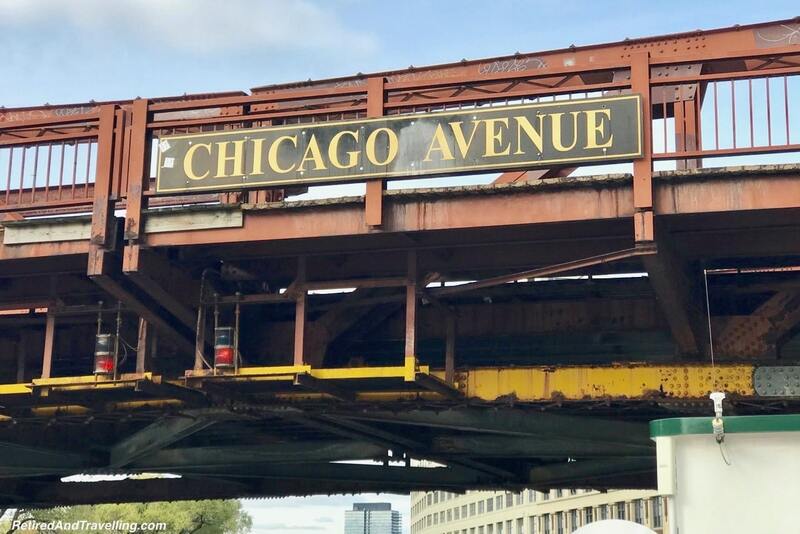 Today, only seven of Chicago’s moveable bridges are manned 24-hours a day. 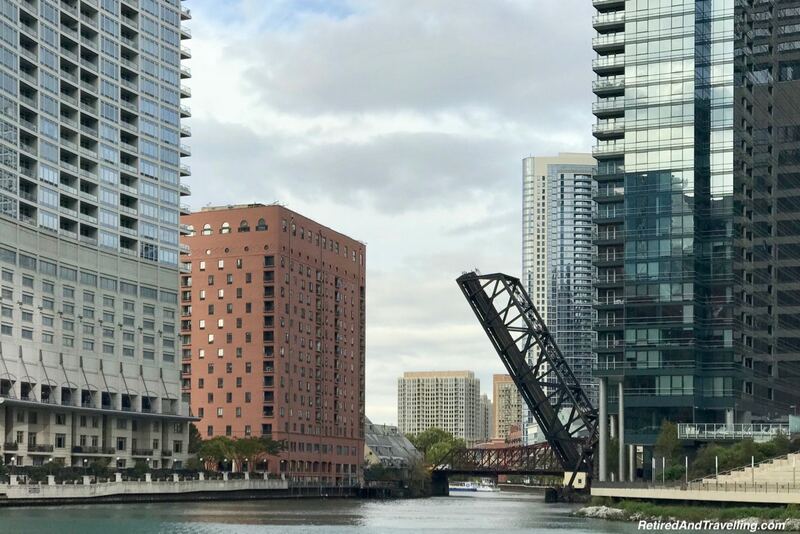 The bridges and bridge tender houses provided our first view on the water of the eclectic Chicago architecture. There was a broad collection of historic buildings. 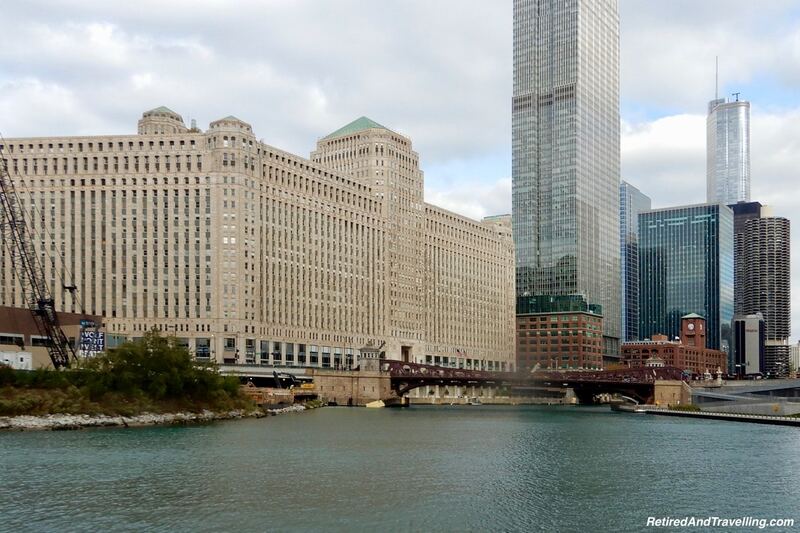 The art deco Merchandise Mart was the largest building in the world when built. 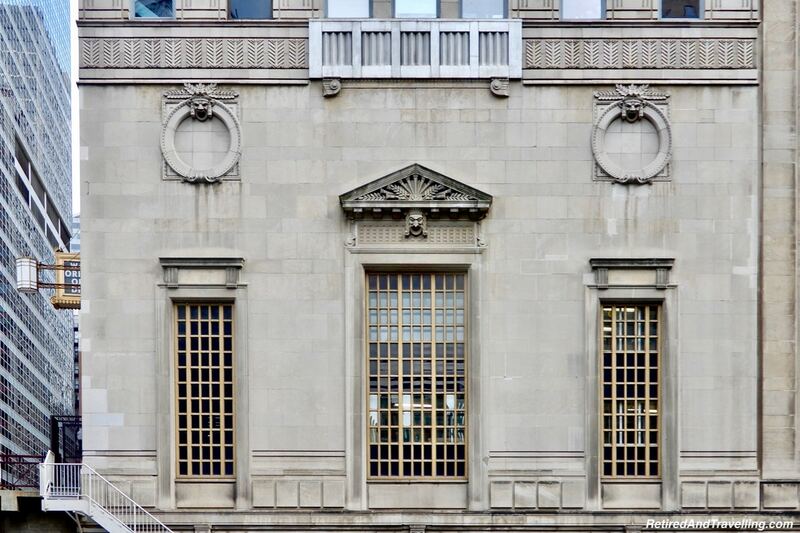 It was established as warehouse facilities for Marshall Fields. Beside that we saw the red brick Britannica building (aka the Reid Murdoch Centre). 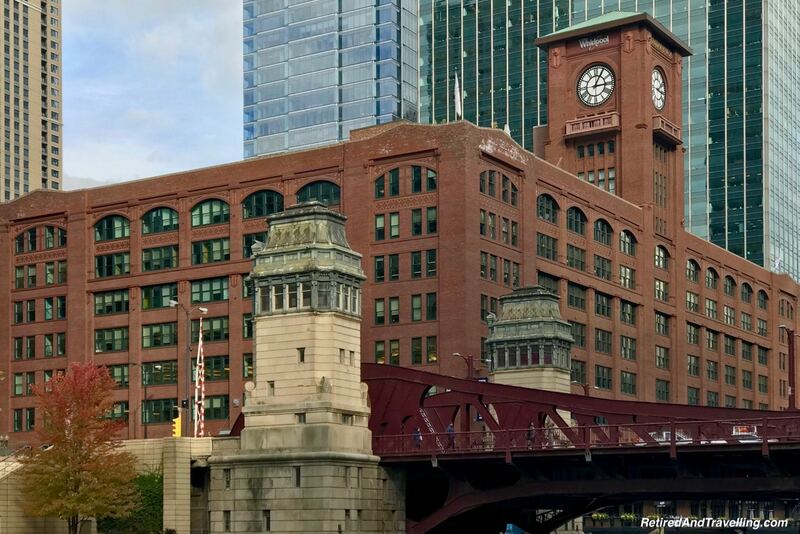 This Chicago landmark is currently the headquarters for Encyclopedia Britannica. Other old warehouse properties have been repurposed and restored for use as commercial or residential properties. The docent spoke about “adaptive re-use”. 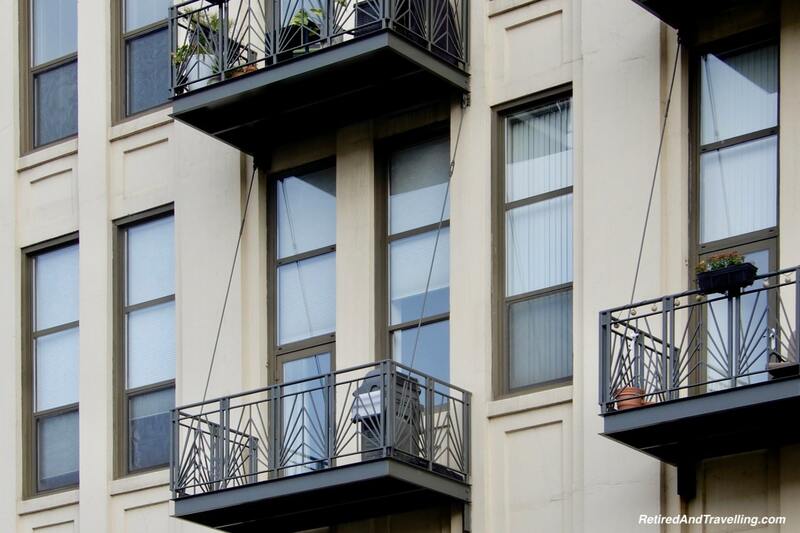 Many along the architecture cruise path had distinctive balconies facing the river. 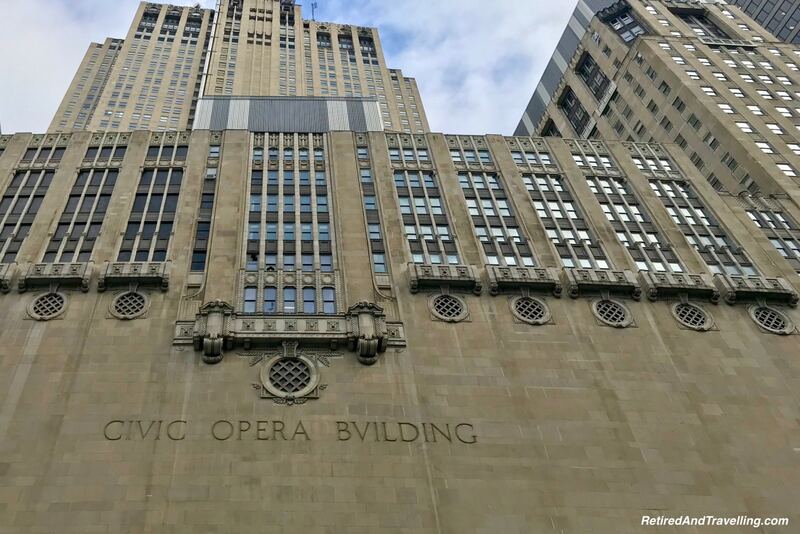 The Civic Opera building towered high over the banks of the river. 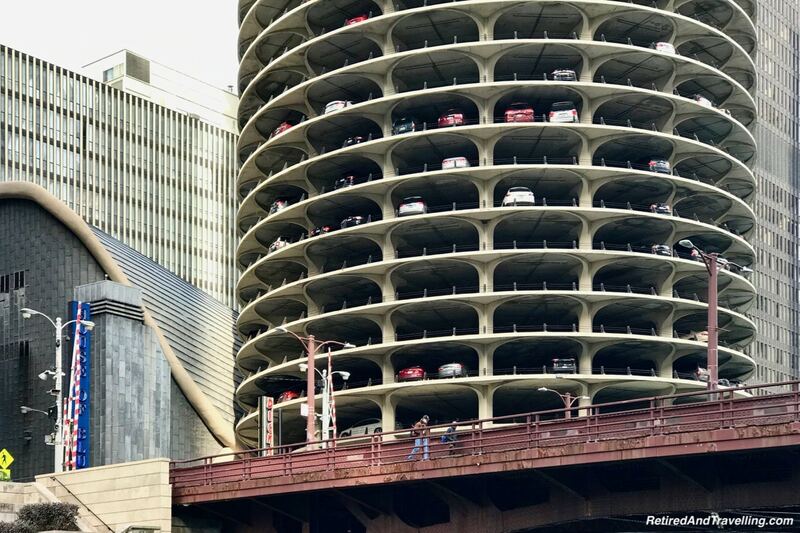 Two different round building complexes were designed by Bertrand Goldberg to bring families back into the city. River City consists or what looks like a series of circular buildings all connected together. 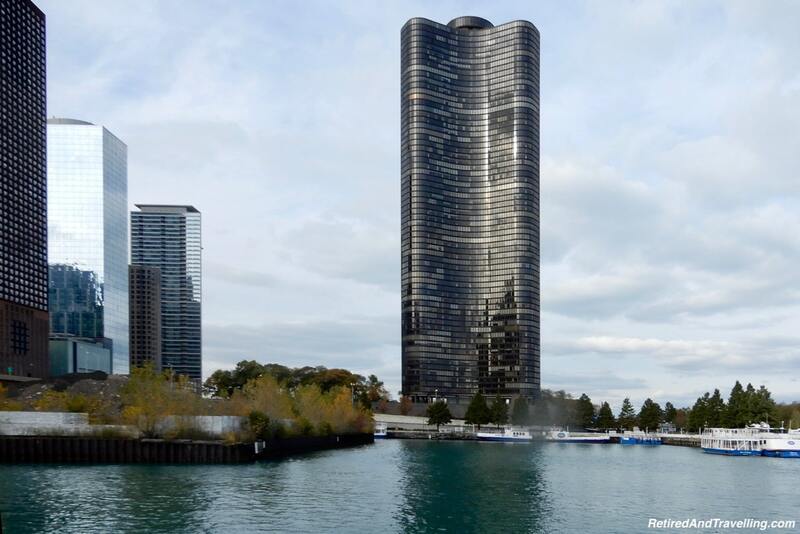 Marina City consists of two taller round towers. The bottom levels are open car parking lots. We saw cars backed right up to the edge. Beside the buildings is a concert hall that was built and is now the House of Blues. 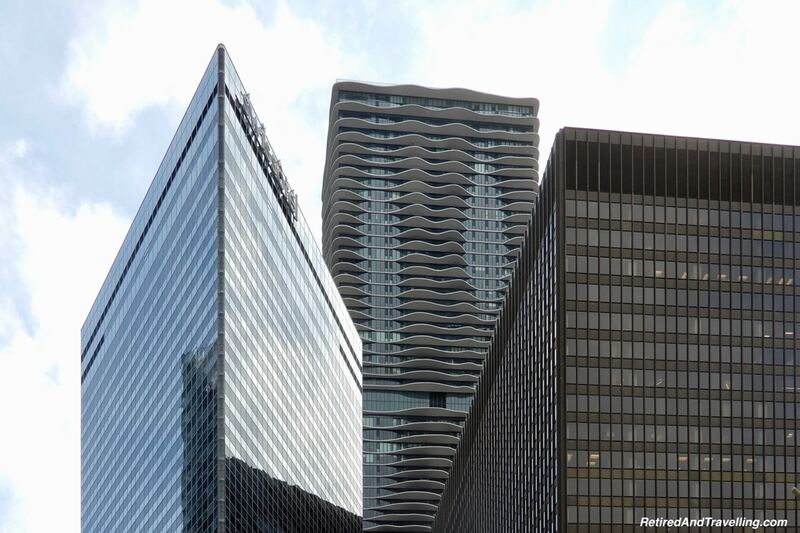 Contemporary tall glass buildings set amidst the eclectic Chicago architecture. 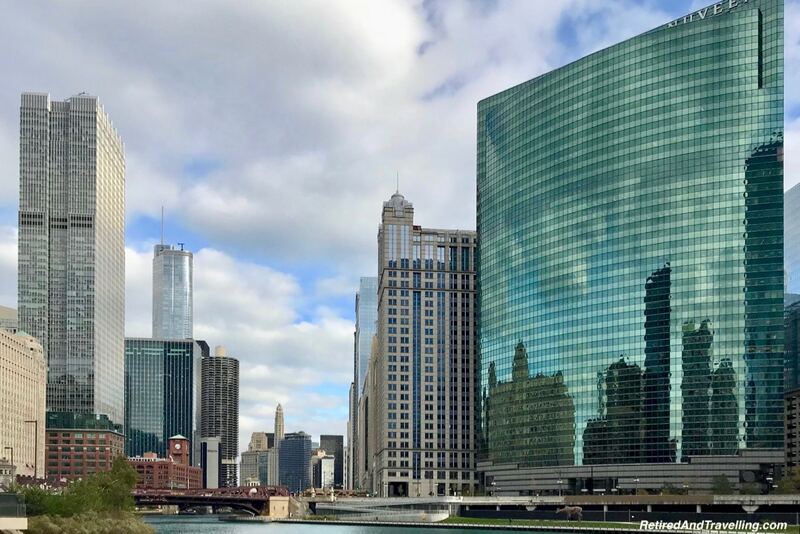 Glass of all shades sparkle and reflect back the sky, the buildings and the river. One of the buildings even had a map of the river and bridges seemingly etched in. As in many cities on the water, much of the new waterfront development is residential. 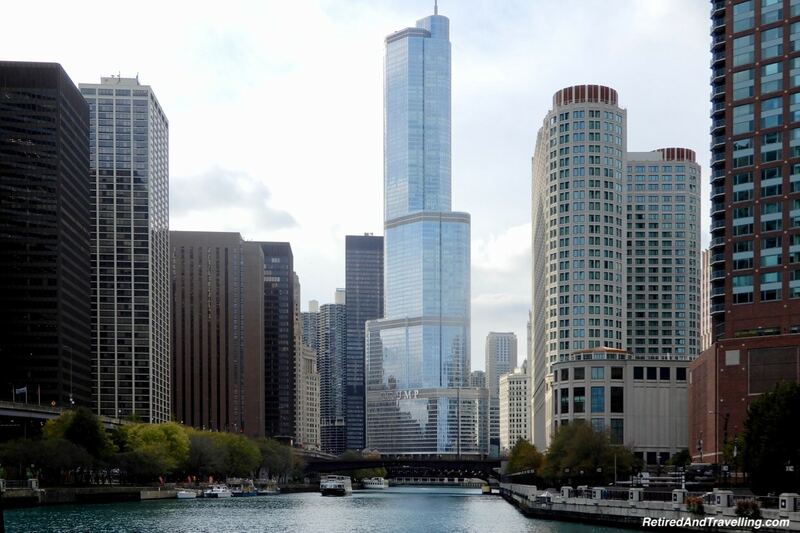 In Chicago we saw both lower and high rise buildings built along the river. Designs ensured that access to the waterway path remained open. It was interesting to see the mix of new and old buildings side-by-side as we moved along the river. 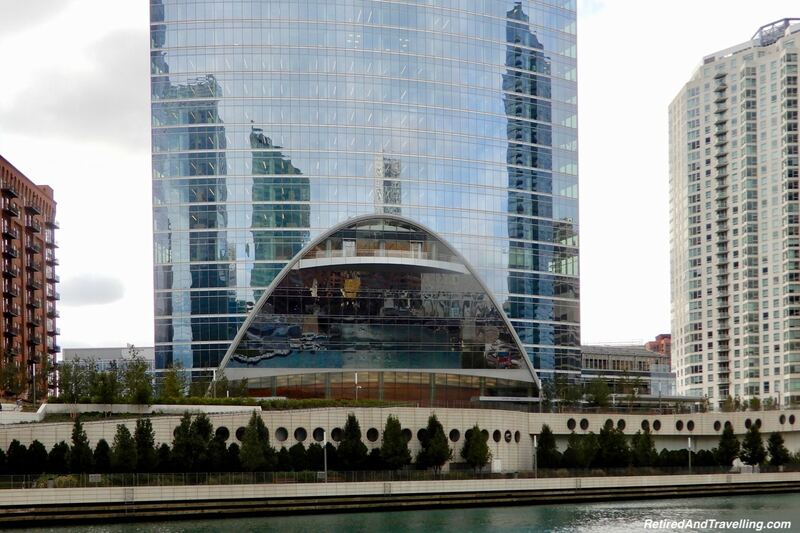 It was fascinating to see some of the unique buildings that are on the river in Chicago. Building designs addressed the unique challenges of the surroundings. The building at 150 N. Riverside needed to have a very small base. 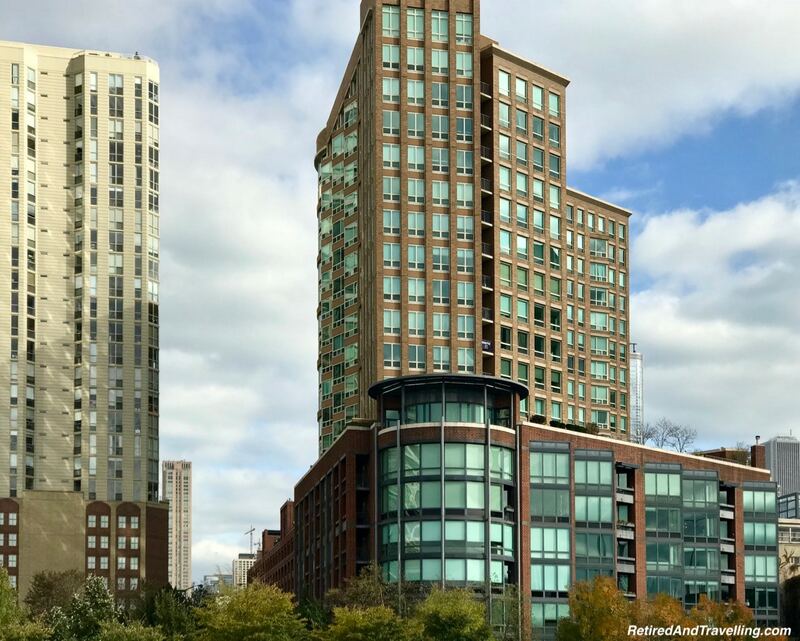 Rather than constraining the total size of this building, the designer created a long sloping front and back for 8 stories that tapered out as it went up. 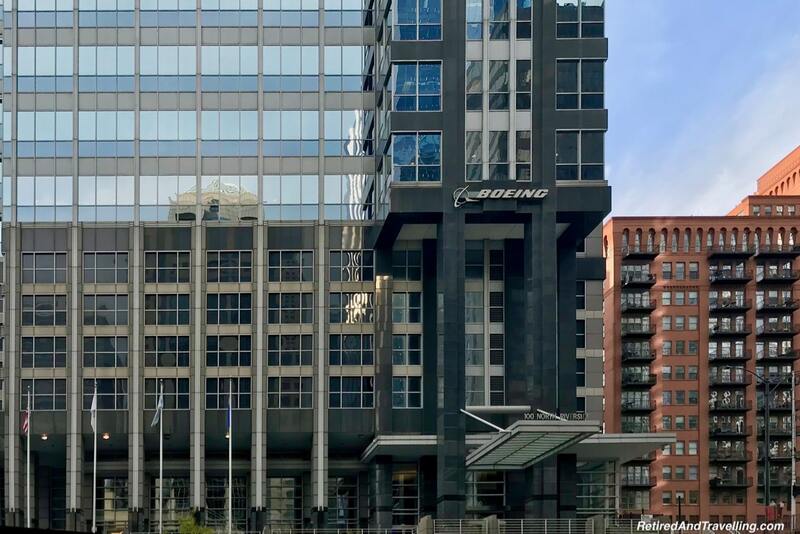 The Boeing Building is built right over the railway. 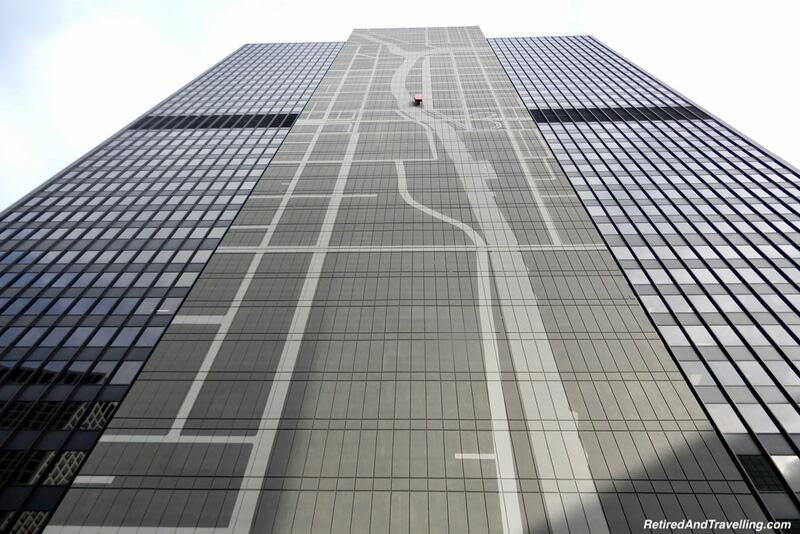 As a result, elevator shafts could not be put below the ground floor. As a result, the bottom floors all have escalators to reach the first elevator floor. 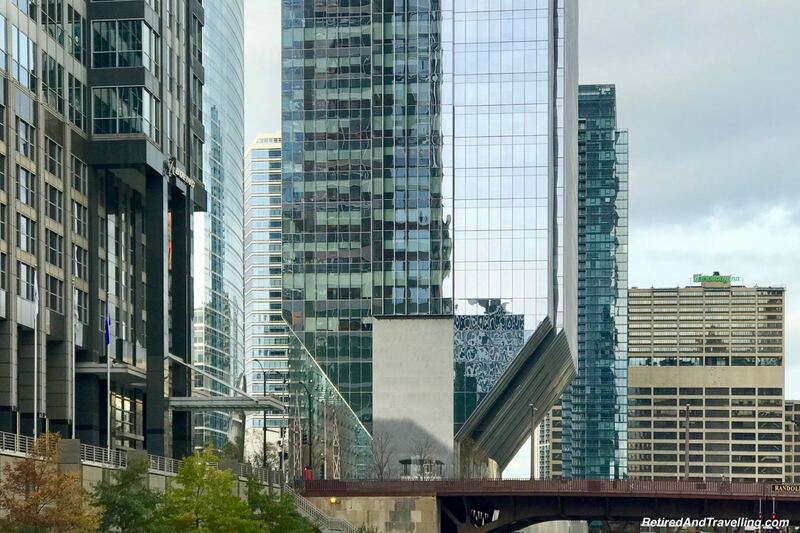 The building at 333 Wacker is a curved green glass building that follows the curve of the river. 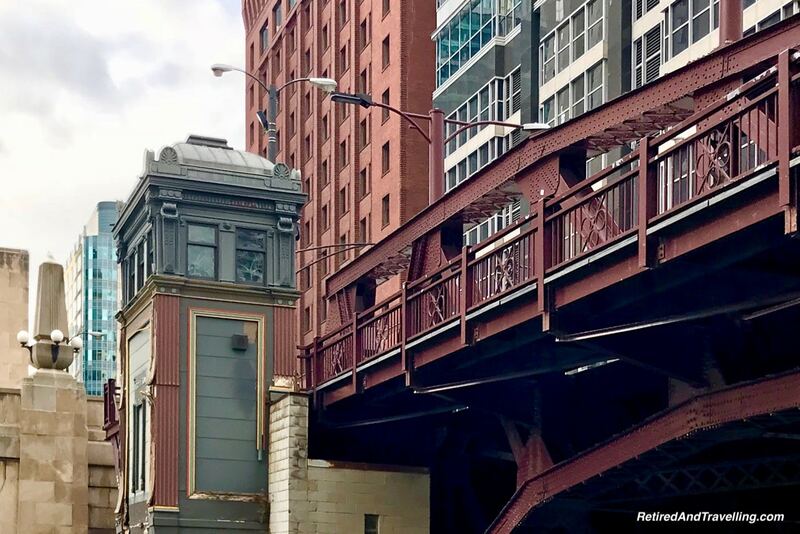 The ingenuity of the architects and engineers that built Chicago can be seen in the eclectic Chicago architecture. We got a good close up look at the architecture of Chicago as we walked around Chicago. There were interesting buildings in every direction. 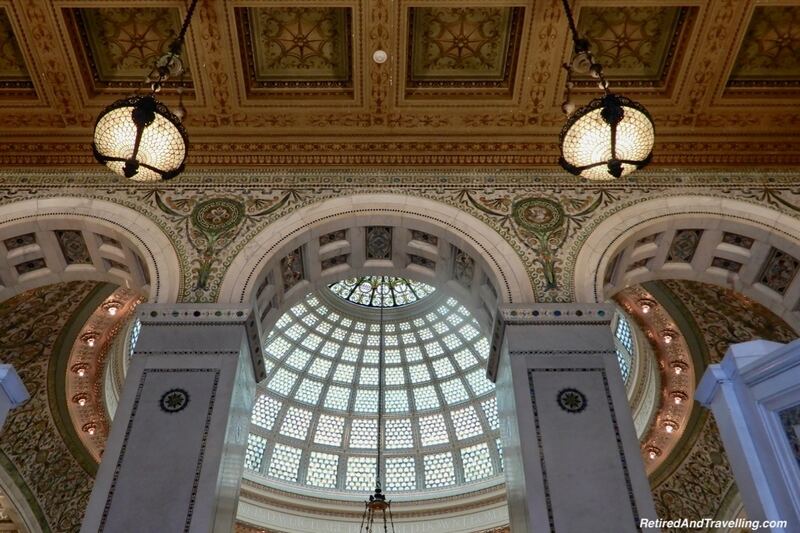 It was a treat when we ventured into the Chicago Cultural Centre and saw the massive glass domes. We got one broad panoramic view of the buildings when we went high in the John Hancock Building. 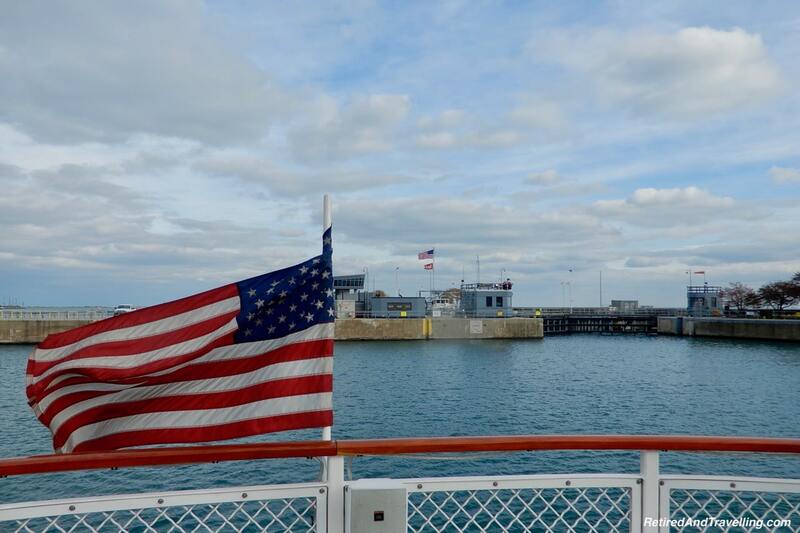 We got other panoramic views when we went out to Lake Michigan. 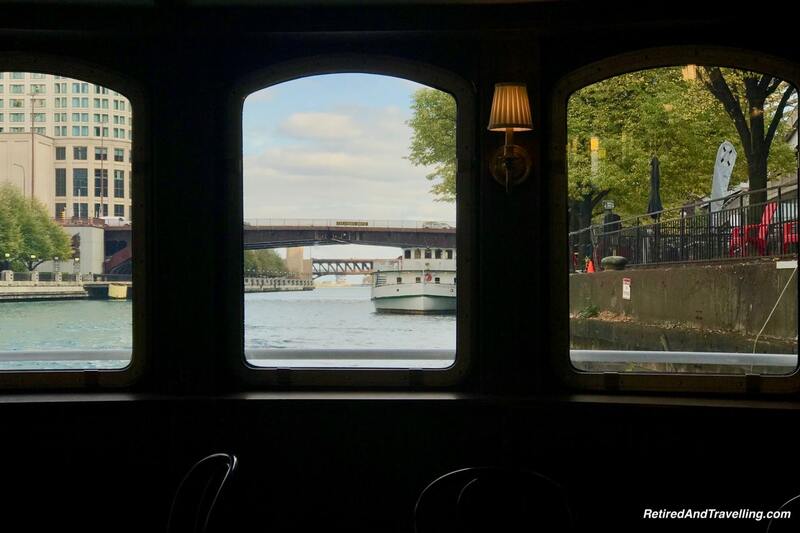 The architectural cruise took us to the lock just before the lake. 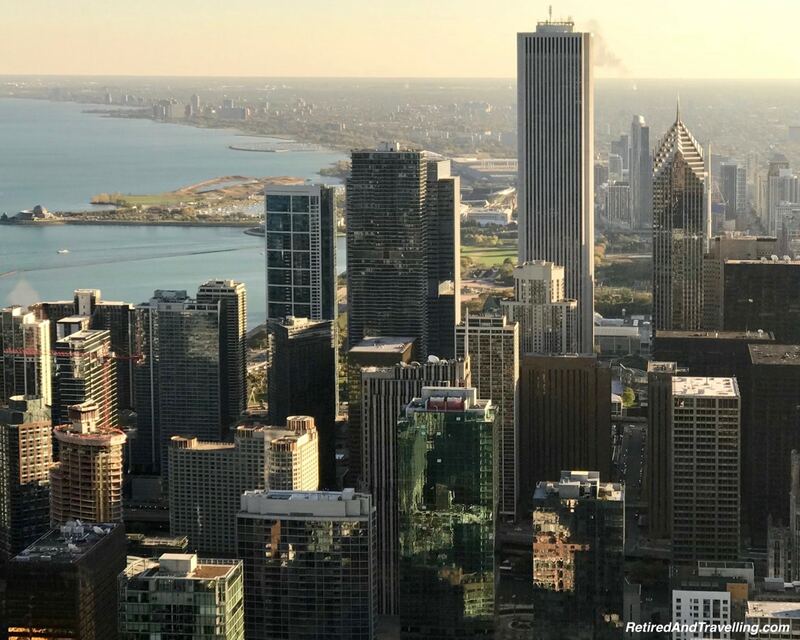 From that vantage point, we looked back and got a great view of the diversity of the skyline of Chicago. One other day we bundled up and headed towards Navy Pier. 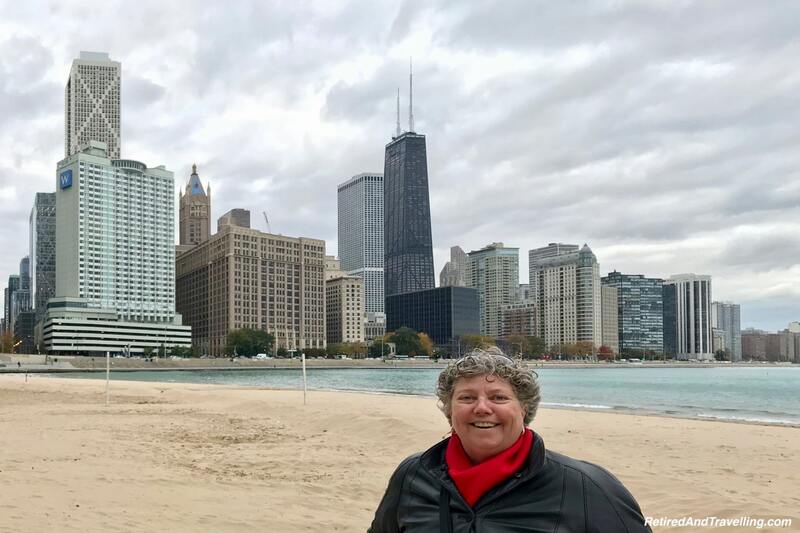 We stopped along the beach and got another view of the architecture skyline of Chicago. 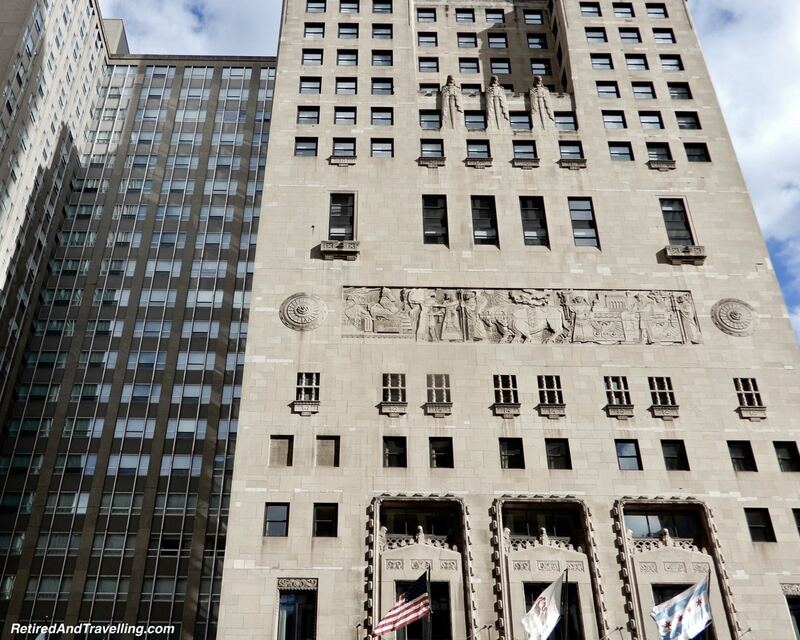 It was interesting to see many of the eclectic Chicago buildings from different perspectives. 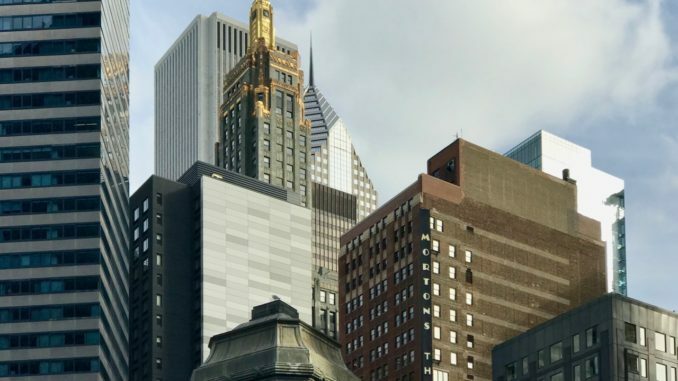 No matter how you explore, you will be fascinated by the eclectic Chicago architecture. We spent hours seeing the buildings from the ground, from on high and from the river. Every new perspective added another dimension. Our hotel was in a perfect location to explore so many different buildings. We got a treat when we found out that our hotel was an architectural treasure itself. 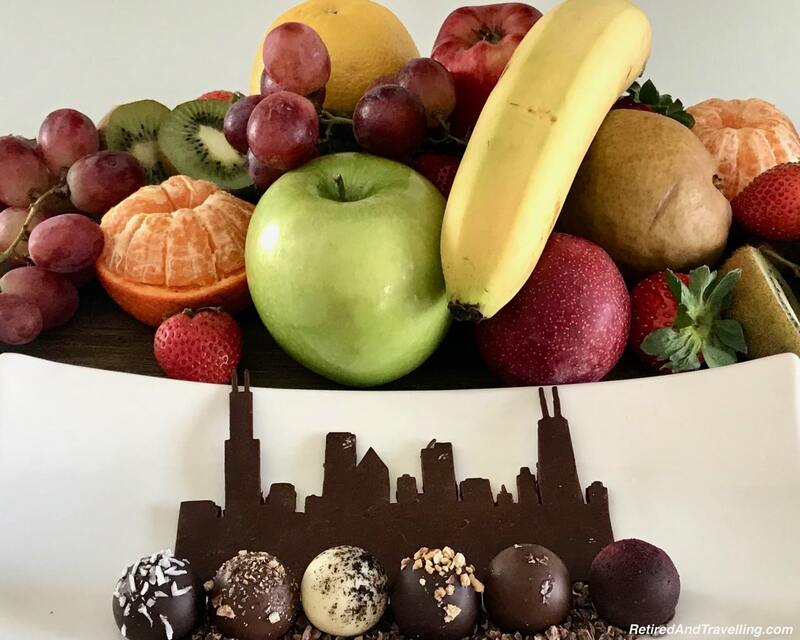 Our welcome treat when we checked into the Intercontinental Chicago even showed off the skyline! We crammed a lot into 3 days in Chicago. But every time we looked a a building we saw yet more detail. 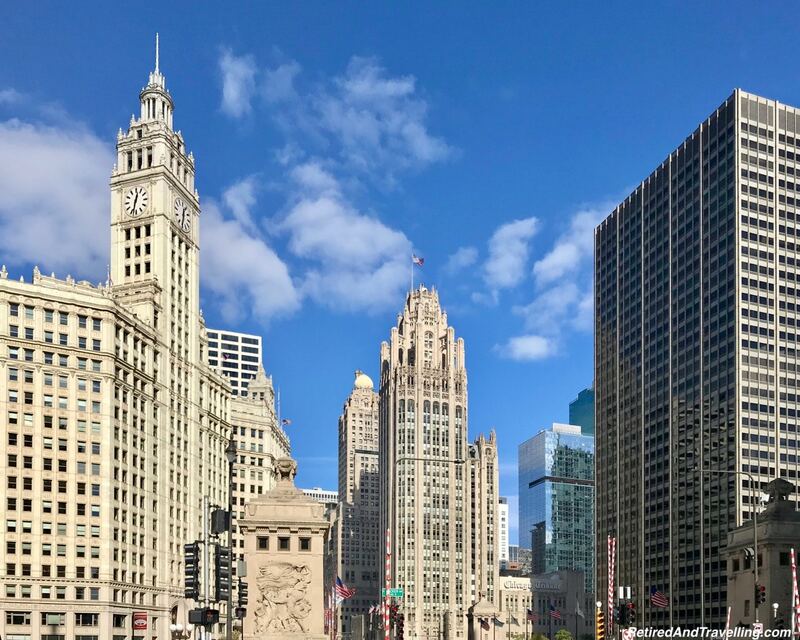 We know there is still more to discover on a return trip to Chicago. 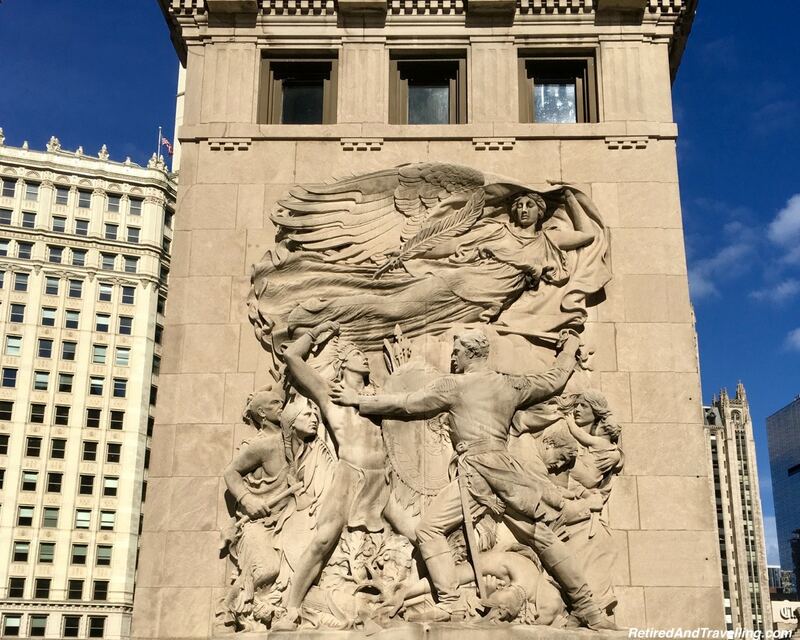 Did you discover the eclectic Chicago Architecture? Did you have a favourite building or style? Beautiful photos and great post! I’ve wanted to explore Chicago for so long and now I’m truly motivated. The architecture looks phenomenal, plus I’m in love with the chocolate skyline! I’m definitely going to consider this for our next family vacation. My one and only visit to Chicago was just over ten years ago, yet I was surprised how many places I recognised in your photos! The circular parking lots are very distinctive, I don’t think I’ve ever seen that anywhere else. I wish we’d taken a river tour like you did; what a good way to the see the city from another perspective.